In the video, Out of the Past: "Artisans and Traders" (60 min., 1997, VC 2130), presented another example of a cross-cultural approach used in archaeological interpretation, as well as an example of an attempt to interpret male-female activity spheres as represented in pottery making at Teotihuacán. In 2006, "Mexican first lady Marta Sahagún toured the National Museum of Women in the Arts in Washington, D.C., with first lady Laura Bush and the first lady of Peru, Elaine Karp. The exhibit features archaeological finds from Mexico and Peru that show that long before Europeans arrived, women served as warriors, governors, artists, poets and priestesses." The U.S. Department of State's Bureau of International Information Programs provides a transcript of the "REMARKS BY THE FIRST LADY AFTER TOUR OF THE 'DIVINE AND HUMAN: WOMEN IN ANCIENT MEXICO AND PERU' EXHIBIT." National Museum of Women in the Arts Web site. Be sure to view their interactive preview. Ancient Portrait of Maya Woman Found--Who Was She? 1. From what you can tell from the information on the exhibit, and from the texts and from in-class materials, how do archaeologists "explore the feminine 'sphere' in cultures as varied as the Aztec, Mayan, Zapotec, Moche, Mixtec, and Incan"? 2. What is the value of a cross-cultural approach in the exploration of "the feminine 'sphere'"? From what we have learned in this course, there are many ways that archaeologists "explore the feminine 'sphere' in cultures" that are quite varied. To understand the roles women played in the daily and spiritual life of many cultures, archaeologists study the sculptures, textiles, pottery, jewelry, and grave goods that have been discovered in remains of the civilization. In the exhibit in the National Museum of Women in the Arts in Washington, D.C., this is exactly what the goal was intended to be. By studying the remains of these cultures, archaeologists hope to gain a better understanding of the role women played in Ancient Middle American cultures. According to the National Museum of Women in the Arts, archaeologists have been gaining a greater understanding of the feminine 'sphere' in cultures because more and more people have been looking at womens' roles in ancient cultures. Archaeologists have been piecing together these artifacts to understand the daily roles of women in these cultures. Other archaeologists have been exploring the feminine sphere of ancient cultures by the recent discoveries that have been made. In 2005 in the jungles of northern Guatemala, archaeologists found a stone carving of a woman with her hands held straight in the air. Dating back to the fourth century A.D., the artifact shows that women had powerful positions in early Maya societies. 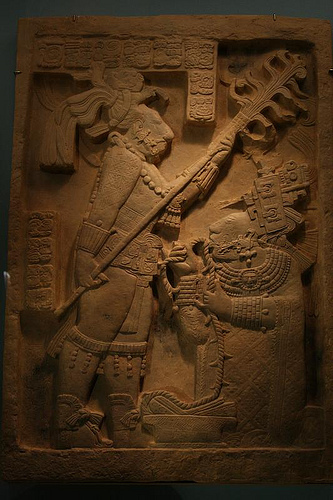 In addition, it is thought that women were queens or deities in the Maya civilization. What's more, many images of queens have been found that date back even further. The women in the depictions wore elaborate headdresses and had sacrificial dishes, according to the National Geographic article. Furthermore, the inscriptions on many of these find have been damaged, probably because of warfare that happened. When it comes to another group, such as the Aztec, discoveries have been made about the role of women from excavated images that have been found, according to BBC Radio. Overall, from all this information that we have looked at in class, we can conclude that archaeologists study the feminine sphere of a variety of cultures by looking at artifacts that have been found in the ancient sites. By looking at stone art, pottery, textiles, and so much more, archaeologists can piece together the role they think women played in Ancient Middle American civilizations. We know about the role women played in the Mayan civilization because stone artifacts show women in positions of power. In addition, findings in Aztec sites show that women may have had a similar role. Thus, it is from the findings of ancient artifacts and the comparing of these artifacts that we know about women in Ancient Middle America at all. The differences between these artifacts show how the roles of women may have been different in these extremely varied cultures. A cross-cultural approach is extremely valuable to to explorations of the feminine sphere. By looking at the role women played in a variety of different cultures, archaeologists can compare these cultures. In fact, the role women played in Ancient Middle America may have been quite different in these cultures. This is important because anthropologists can then study the reasons why these civilizations may have been different. Were they affected by agriculture and the climate of the highlands or lowlands of Mexico? Did the varying spiritual beliefs of these civilizations dictate the role women played in their society? Looking at these artifacts will help archaeologists answer these questions and piece together the whole of Ancient Middle America. A cross-cultural approach is also important because it may lead to a greater understanding about how these civilizations may have interacted with one another on a larger scale. Basically, these studies may help archaeologists understand how all the civilizations of Ancient Middle America came together and interacted, possibly partaking in warfare with one another. All in all, a cross-cultural approach leads to a greater understanding of the feminine sphere because cultures can be compared, and the study will lead to a greater understanding of women's roles throughout Ancient Middle America. Archaeologists study the role of women in ancient times by looking at the decedents of the groups today and by studying ancient texts and wall paintings. they also look at the things women made and even sometimes how they were buried. there is a great value in cross-cultural approaches in studying any culture because we can make ties and assumptions based on location of the people, the time in which they lived, the climate in which they lived, and how they must have divided up jobs amongst the men and women. it is also valuable when we are comparing two races. 1. I think they gather whatever information they can from what they find. Archaeological sites hold a lot of information and most of it references men and their achievements. In the exhibit, it even says women are carved into stone with skulls for faces, so there is definitely a different way they portray women in their society even though they could hold high positions in society. 2. I think that by comparing between the different cultures, we are able to see what the differences and similarities are for women in the separate societies. It's interesting to see whether some cultures who started separately converged and had some of the same roles for women. The feminine "sphere" in various cultures is explored through various finds such as textiles, jewelry, and pottery that tell us something about the women that existed within these cultures. These artifacts tell us things about the roles these women played within these societies. The value of a cross-cultural approach is that there is going to potentially be some similarities and some differences between cultures in ancient Middle-America because many of them have roots in the same society. Comparing and contrasting the similarities and the differences between these cultures can tell us a lot about each culture in question as well.